Forget about the stats. Forget about the radar gun. Just sit and watch Brendon Little pitch for an entire game. Settle in behind home plate, get your beverage of choice and maybe some popcorn, and watch how hitters react to his curveball. 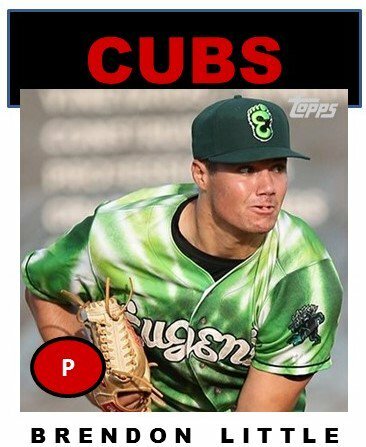 After you’ve done that, you will understand why the Cubs took Little in the first round in the 2017 Draft. Little is far from a finished product and still has several things to work on. But if you see anybody actually square up that curve, you’d better call me right away. Because I watched him pitch live twice last year and I didn’t see anybody put good wood on that pitch at all. I can see where people might doubt Little’s ability since his statistics are not the greatest. But they don’t have to be. He already has his curveball down and doesn’t need to throw it as much, so he’s been working on other pitches and just learning how to attack professional hitters. Everyone I talked to about Little last summer said he is an extremely hard worker. He’s checking out video, poring over data from the Cubs’ various forms of technology, going over game plans, and generally putting in all the extra work it takes to improve. To add onto that, Little is usually among the first players (along with Miguel Amaya) to start signing autographs before the game and the last ones to leave after. When it comes to the 2019 season, here are five things to look for from Little. When he missed up with the fastball last year at South Bend, he got lit up like the Fourth of July. It was not pretty. When he kept it down, however, he did fine. While a little extra velocity would be nice, location would be even better. Taking a look at his month-to-month splits, there is a lot of variance in his performances. Little needs to be more consistent from start to start in order to dominate at high-A. It could come this year at Myrtle Beach or it might happen next year at Double-A Tennessee. Little’s got the curve down and we already mentioned the fastball, but he doesn’t have a third pitch that we could even call average. One thing I noticed last year, especially early on, was that Little worked a lot of deep counts. Some of his starts were of the 2-3 inning variety. Then, come May, he started getting into the 5th and 6th innings regularly. By August, he looked to be a little tuckered out, rarely pitching beyond the 4th inning and running up 80+ pitches a bit early. Just because it doesn’t work Monday doesn’t mean it won’t work Sunday in the next start. Little will be at Myrtle Beach and with pitching coach Brian Lawrence again, so here’s to hoping that continuity will keep Little settled as he grows. I look forward to watching Little’s first start of the year just to see what he’s been working on this winter. Ideally, his fastball bounces back and a third pitch comes around. If that happens, he won’t be in Myrtle Beach very long. Still, he’s only 22 and there’s no need to rush. With a full year under his belt now, Little should be much improved from last year.